Introduction: Strike Pro is one of those companies that seems to offer every kind of lure imaginable and even has a few lures that can�t be defined by one category alone, the Flex Crawfish is one such a lure. Making use of the company�s �bike chain� design this new hardbait is designed to be the most realistic crawfish hardbait on the market. Impressions: We first saw the Strike Pro �bike chain� joint design on the company�s Flex Phantom swimbaits. This double reinforced design makes it possible create a tail with many segments allowing for a unique side to side wave motion when retrieved. 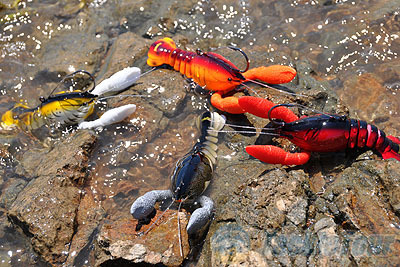 The Flex Crawfish makes use of the same basic design but in a slightly different implementation. The joints are placed perpendicular to the body so that when the crawfish is retrieved the lure�s tail is designed to tuck underneath the body and straighten out when at rest, much like a real retreating crawfish. 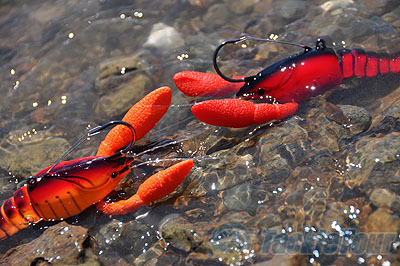 A rattle is also added to the lure to mimic the sound of a crawfish moving underwater. 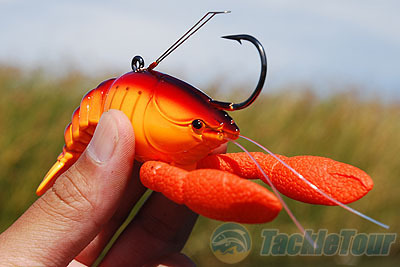 The Flex Crawfish comes with rubber claws which can be adjusted in different angles as well as realistic looking monofilament whiskers. 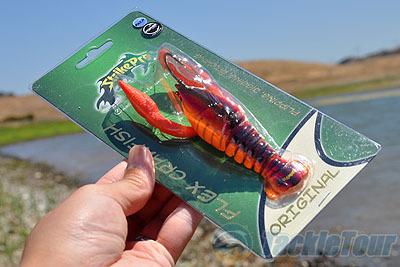 The body and head of this lure look just as realistic as the tail section and Strike Pro offers the Flex Crawfish in a number of lifelike patterns. Finally, the lure comes armed with a single Owner hook complete with a weedless wire. 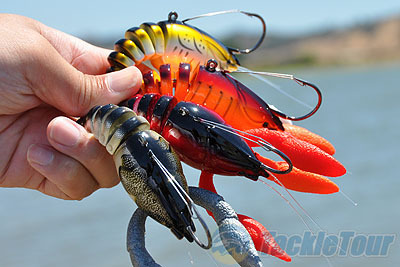 The Flex Crawfish is not a small lure and is larger than traditional jigs, the bait is nearly 4 inches in length and weighs 2oz. 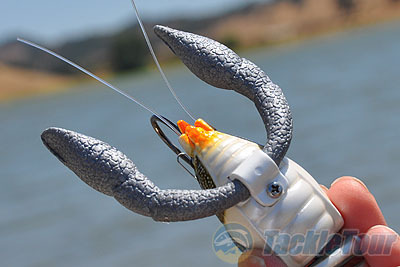 It is designed to be a fast sinking lure that can be worked on the bottom like a jig. Strike Pro advises anglers to adjust the claws upwards on each bat so that it will fall properly and looks like a crawfish in a defensive position when fished. The claws are held in place with a screw bracket which doesn�t need to be loosened to adjust the claws, simply pull outwards and the rubber will stretch and become thinner making it easy to rotate the claws. Before heading out to fish the crawfish we inspected each of the different patterns and found the quality control on the baits to be excellent. There were not inconsistencies, and while the lure does not look or feel like a custom made bait it does have a little �swimbait� sort of appeal. I have to admit I had a lot of fun just posing these critters for pictures before getting them in front of actual fish. Once we got the shots we needed it was time to see what this realistic looking bait could do in the water. Real World Tests: To test the Flex Crawfish we head to a number of Northern California Lakes as well as the California Delta. We hit lakes where we knew there were plenty of resident crawfish and others where we had never previously observed any of crawfish at all. 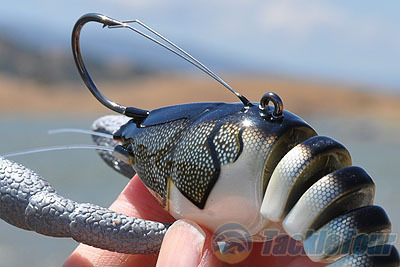 Casting: The Flex Crawfish is a relatively heavy bait at 2oz. and I quickly found it is best fished with a stout football jig rod or flipping stick. With these heavier sticks it is easy to both cast and pitch the lure much like I would normally do with a heavy jig or Texas rigged plastic. Once the lure hits the water it sinks relatively quickly and it is easy to feel positive contact with structure. Next Section: Turn up those claws!